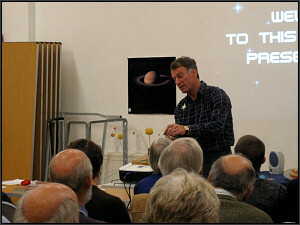 The Open Evening held last night, on Friday 27th, was a great success following a good local turnout. Douglas opened proceedings with a brief, enthusiastic discussion for our visitors... relating Tiverton to the rest of the cosmos! Using his trusty home-made model of the Solar System, he also described the current unusual configuration of the planets, most of which are on the far side of the Sun from Earth (i.e. they are approaching, or have recently passed, conjunction). He soon gave the floor to returning guest speaker Andy Lound of the Planetary Society, who enthused about current astronomical research through the use of large-scale instruments on Earth and via satellites and space probes on various missions of discovery. 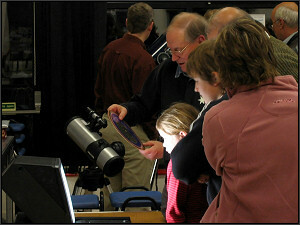 He reminded us that interest in astronomy always begins at home, and that it is the one science that opens our minds to the truly big questions - such as how eveything began and our role in the universe. 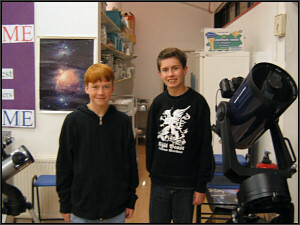 He also considered it quite likely that by the time some of our younger visitors grow up, a career in a space-based industry would be a much more realistic option than for previous generations. The evening ended with the usual refreshments and a chat, in which many of our visiting guests asked about the society, glanced over the displays and had a look at the telescopes. Unfortunately we were denied a chance to observe the night sky owing to the bad weather, but this one small setback didn't diminsh what was a fine evening's entertainment.